Wigan returned to the kamikaze defending of early last season when they conceded two goals within the first six minutes against the European Champions Chelsea. 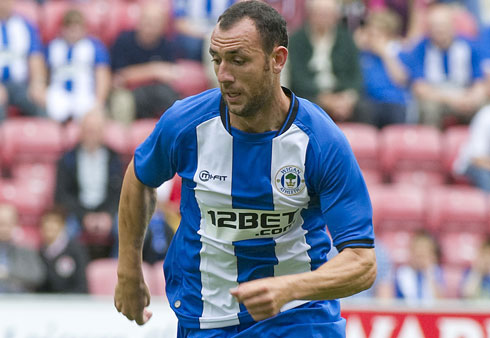 Ivan Ramis making his debut from Real Mallorca had an unfortunate start to his career at the DW stadium. In the second minute Franco Di Santo gave the ball away needlessly and Ramis allowed Eden Hazard to turn too easily and play the ball through to Branislav Ivanovic who finished comfortably. Soon afterwards Ramis recklessly challenged Hazard in the box and the Belgian midfielder went to ground giving referee Mike Jones little alternative than to give a penalty. Frank Lampard stepped up and his low drive beat Ali Al Habsi from the spot. It was a torrid start for the Latics and many of the Wigan fans in the stadium feared that a rampant Chelsea would go on to score many more. But Wigan rallied and to his credit Ramis did not allow his indiscretions to disrupt the rest of his performance. James McArthur and James McCarthy were gaining a greater level of possession than their illustrious counterparts and Wigan created some good chances before the break. Franco Di Santo had a one on one with Petr Cech but although his shot beat the keeper the ball was cleared off the line by David Luiz. Shaun Maloney worked tirelessly to create opportunities before he had to be withdrawn with an injury and Victor Moses, a transfer target for Chelsea, was a constant threat on the right hand side. In the second half substitute Jordi Gomez had two great opportunities to score, when his first shot curled wide of the post then with his second effort he acrobatically volleyed over the bar. Chelsea created relatively little considering the wealth of talent on display, although Fernando Torres did have a rare chance when he got the ball past Al Habsi but Ramis made some amends for his earlier misdemeanours by clearing off the line. New signing Arouna Kone replaced Di Santo and showed some good touches and had an opportunity to open his account in the 84th minute but his powerful header went wide of the goal. Some Latics supporters will point to the cliché of needing to get ‘points in the bag, early doors’ but beating the European Champions in the first game of the season was always going to be a tall order. Despite the defeat the fans should not be too despondent as after the early setbacks the team acquitted themselves very well against top class opposition. Even without the injured Jean Beausejour, there were positive signs that they can build on the form they showed at the end of the last campaign. Some typical tiki taka passing was in evidence and they created enough chances to have at least drawn the game. This entry was posted in Branislav Ivanovic, Chelsea, Frank Lampard, Ivan Ramis, Wigan Athletic and tagged Branislav Ivanovic, Chelsea, Frank Lampard, Ivan Ramis, Wigan Athletic. Bookmark the permalink. went to the game, chelsea looked quite strong apart from luiz, flaky as usual. wigan played well but didn’t cause chelsea enough problems given the large amount of posession they had, there is cause for optimism for both teams but you felt that had chelsea needed to, they could easily have stepped up a gear and scored again. brilliant value at the dw once again, 24 quid for premier league football, well done wigan !